On Monday, billions of people will cast their stares skyward to catch a glimpse of the eclipse. 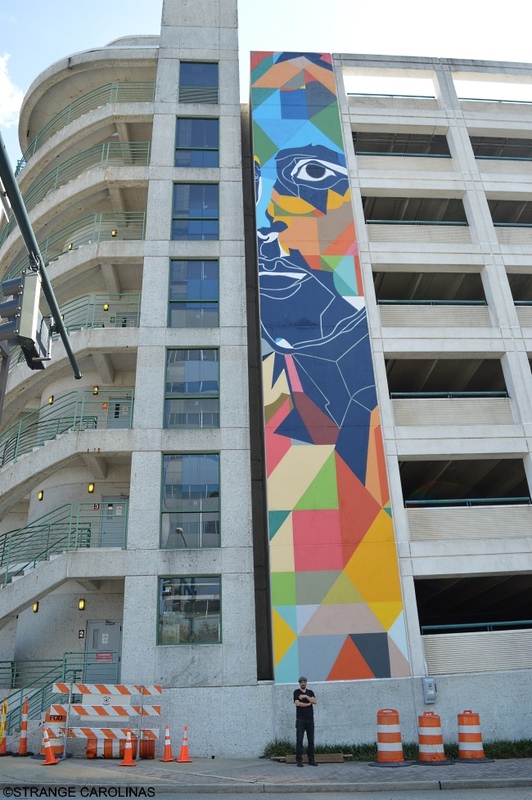 People in downtown Greensboro have had their eyes trained on the skies for weeks because international artist DAAS has been working on two 80-foot-tall murals on the Bellemeade parking deck. The murals are now complete and the city is throwing a party for them and DAAS on August 17th. 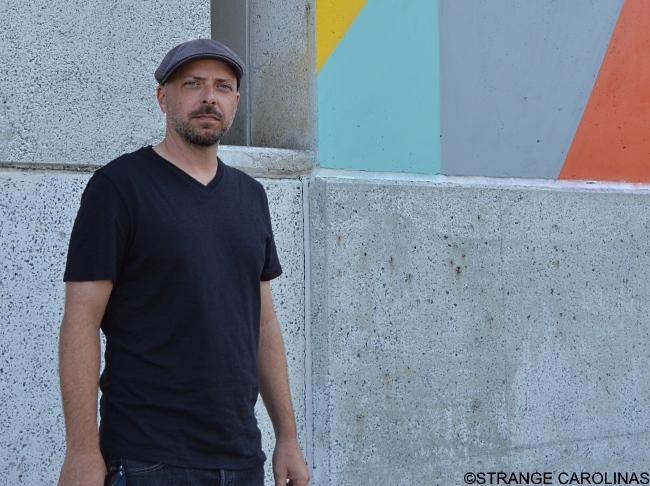 We caught up with DAAS to talk about the Bellemeade murals, the inspiration behind them, Greensboro art, and what's next for him. What are these two pieces called? "Thought Forms" is the title. The one here on the north wall is more introspective, with the position of the face and the expression, whereas the one on the south wall is more anticipatory, kind of looking toward the future. I use the colors and geometric shapes to represent ideas and emotions and thoughts we have. The inspiration came from the shape of the building, how to fit something in there that conveyed emotion without stacking things. I wanted to do an image that would encompass the whole piece but also be complimentary to each other on both sides. This character that I've used on the wall in the image is a character that I've used before. I've adapted that to this mural. You mentioned space. How hard was it to work with this space, being so long and thin? It was a lot easier than I thought. The most difficult part was being eighty feet in the air. When you're up there, it gets a little nerve-wracking. For the first ten feet from the top, it gets a little wavy from the wind but after that it gets smooth. How many hours did you put into these? It was ten days total, so I would say probably about one hundred hours. Are these the tallest you've ever done? Yeah. So far. I feel like it's actually preparing me for higher and larger pieces. It seems like this year, each piece has almost doubled in size. 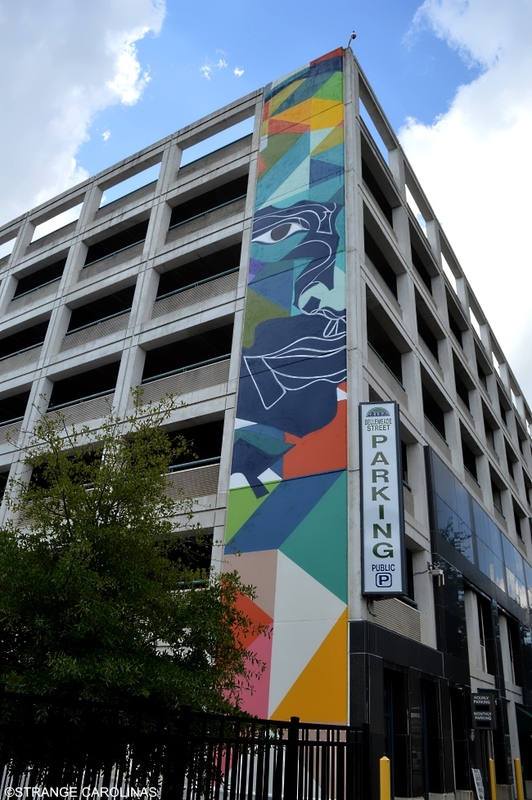 Have you had a chance to see any other Greensboro murals or meet any local artists while you've been here? I went down by a place called Tracks Bazaar and met with Marty Kotis and Ryan Saunders. They gave me a tour of all the great art over there. My project manager, Phillip Marsh, who runs Rockers Print Shop, he took me on a driving tour and a walking tour to see some of the art that's here. He's trying to get more artwork done in the city by not just international but local artists as well. He wants to create a balance. It's what I've always wanted to do since I was a child, seven years old. I just never gave up. What's your favorite piece that you've done? I have a lot of favorite pieces. I think it's more the situations that I was in. I just finished this one, so of course I'm going to say it's my favorite one. It's my latest. And it was probably the most physically challenging and mentally challenging dealing with that structure. You have murals all over the world. Has there been a location that's made a lasting impact on you? When I first got there, I felt like I had found the place I was supposed to live. I felt immediately at home. I do live there now. Next is China. I have a mural I'm doing for a school in Sichuan province. Then from that, I'll be doing another mural in Japan and then I'll be doing a residency in Beijing starting October 1st. Actually, you know what? I'm doing a mural at Tracks Bazaar. That starts on Friday. It's a smaller piece. Can we get a sneak peek as to what it's going to look like? It's a take on another piece that I've done before called "Space Girl." I'm basically taking that image and replacing her with a different person. Actually, a young child. After talking to Marty, we threw some ideas back and forth. He really liked the piece. I like the piece too, but I don't want to make it redundant by replicating it, so I just switched out who's in the helmet.